The gradual loss of articular cartilage from the surface of articulating joints is a feature of osteoarthritis. It is marked by degradation of the cartilage matrix, including the large aggregating proteoglycan aggrecan, the small leucine-rich proteoglycans known as SLRPs and the fibrillar type II collagen. Aggrecan provides the water-holding capacity of cartilage, while the collagen II scaffold provides elastic restraint, aided by a protective coat of small leucine-rich proteoglycans. 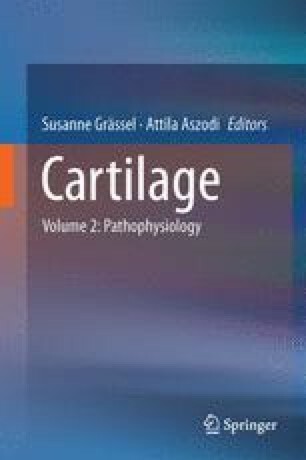 Damaged aggrecan is readily replaced by synthesis of new aggrecan; however, type II collagen can resist only a limited amount of proteolysis before cartilage function is compromised. In this review the major enzyme families of cartilage-degrading enzymes, the matrix metalloproteinases (MMPs) and a disintegrin and metalloproteinase with thrombospondin motifs (ADAMTS) families, are discussed. We examine factors that regulate MMP and ADAMTS activity, with a focus on MMP-13, ADAMTS-4 and ADAMTS-5 as the major protagonists of cartilage degradation. We also compare the effects of blocking aggrecanolysis and collagenolysis separately, or together, on cartilage erosion in a mouse model of osteoarthritis. The role of degraded matrix fragments in regulating inflammation in osteoarthritis, via Toll-like receptor signalling, is also discussed.